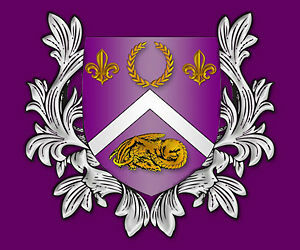 Purpure, a chevron argent between in chief a laurel wreath between two fleurs-de-lys in fess and in base a dragon dormant, wings elevated and addorsed, Or. Blazon: Purpure, a chevron argent between in chief a laurel wreath between two fleurs-de-lys in fess and in base a dragon dormant, wings elevated and addorsed, Or. Order of Squamifer's Fortune - Awarded to individuals who have benefited the Barony through their excellence in the areas of Arts and Sciences, Martial Activities, or Service. Award of the Argent Mountain - Awarded to individuals who have shown initiative in the arts and sciences. Award of the Purple Mountain - Awarded to individuals who have shown initiative in martial activities. Award of the Gold Montain - Awarded to individuals who have shown initiative in service. Award of Dragons Scale - Awarded to individuals who have shown diligence in service behind the scenes. This page was last edited on 7 March 2019, at 15:19.